You are invited to join us for the third session of Exploration Mixed Media at The Artist's Nook in Bellvue, Colorado. For workshop information click here. The workshop concentrates on Art Fundamentals, Drawing, Composition, and Design. Click here to see a sample of drawing and composition. Emphasis for the third session will be Watercolor Basics and Free Form Collage. Contact: artwithmoxie@cox.net for more workshop information. Thank you all who voted. My painting will be in the 2009 calendar. My method of playing is called Free Play. I teach this method to help the students "loosen up" before they start planning a drawing. 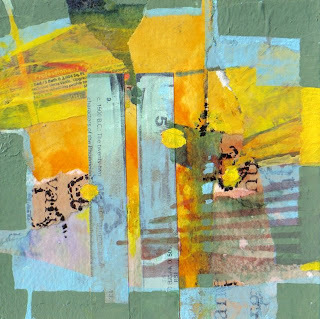 Many times I am asked if it is collage...no, just layer upon layer of manipulated paint. 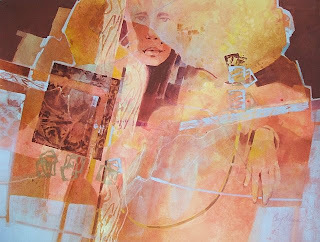 As you can see in most of my mixed media paintings, I love to use the element of line. And, the figure or a face is usually drawn somewhere within the layers.